Ants are social insects and thus the exploration of their ways of communication is an interesting research area. For example, nestmate recognition is essential for ants for the defense against exploitation of nest resources, and such recognition is largely mediated by chemical signals. When two individuals meet they match the label, the chemical signal it carries on the epicuticle and represents the colony odor, with a postulated neural template present in the brain. If the label matches the template amicable interactions between the individual ensue, (photo in the graphical abstract) otherwise they engage in aggressive interaction. Since the ant wax is composed mostly from saturated hydrocarbons, both linear chain and their branched isomers, we decided to explore the chemical structure of ant waxes with the Aviv Analytical 5975-SMB GC-MS with Cold EI which significantly enhances the molecular ion abundances and amplifies isomer structural mass spectral effects. 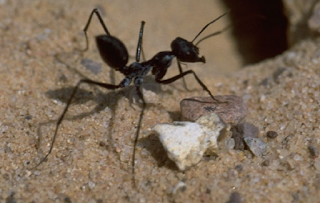 We studies Cataglyphis ants from 17 different nests in various locations in Israel and found that although morphologically they are practically indistinguishable, isomer distribution analysis found significant differences between cryptic ant species or ants from different nests. Thus, the data strongly supports the hypothesis that ant communication is based on branched hydrocarbon abundances as a recognition fingerprint. Keep reading how the 5975-SMB GC-MS with Cold EI helps in ant communication research and to view the important role of isomer distribution analysis in our findings. Injector: 280ºC injector temperature with Pulsed Split injection at 30 PSIG. Sample: Ant wax samples from 17 different locations in Israel. The waxes were dissolved in hexane at about 1% concentration. GC Oven: 80ºC followed by 20ºC/min to 320C and wait 4 min for total of 16 min. He column flow rate: 2 ml/min with flow program after 11 minutes to 12 ml/min at 5 ml/min.min. SMB transferline temperature: 250ºC with temperature program of 10ºC/min after 5 min to 320ºC. Dominant or highly abundant molecular ions were observed for all the ant compounds, (as shown in Figure 1 and 2) in sharp contrast to standard EI (Figure 2). Clear isomer mass spectral effects were observed via isomer related high mass fragments that enabled the elucidation of the isomers structures. These isomer MS effects and the abundant molecular ions proved highly valuable and vastly superior to standard EI in ant wax compounds identification. The use of short column ensured that all the wax sample compounds eluted from the column including minor amounts of cholesteryl esters. The analysis took only 16 min, which is almost three times faster than with standard GC-MS analysis of such wax compounds although the separation is slightly compromised due to the use of short column. The 5975-SMB GC-MS with Cold EI uniquely exhibits uniform response to all the wax compounds thereby as with GC-FID enables quantitative analysis of the wax composition. 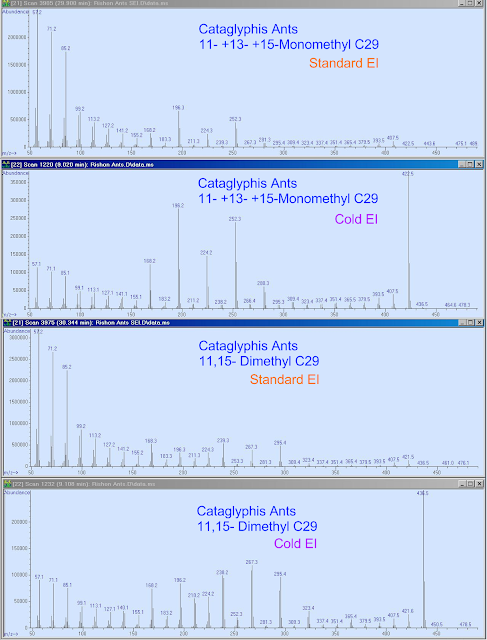 The 5975-SMB GC-MS with Cold EI opens the door for a unique and highly effective isomer distribution analysis characterization of the ant waxes. The 17 ant waxes data could be processed via computer reconstructed single ion monitoring on the molecular ions (RSIM) which enabled clear distinguishing of the various Cataglyphis ants from different places in Israel, even if they were morphologically indistinguishable. Thus, we feel that isomer distribution analysis can serve as a novel tool for ant characterization according to their nest location as demonstrated in Figure 3. Our data strongly supports the hypothesis that isomer distributions play a major role in ant's communication and recognition and that ant communication is based on branched hydrocarbon abundances as a recognition fingerprint. We found that the while ants hydrocarbons with even carbon numbers (total carbon numbers) were mostly in the form of branched hydrocarbons, those with odd carbon numbers exhibited much more abundant linear chain hydrocarbons. This finding further illuminates the biochemical synthetic pathways of ants in their formation of epicuticle wax. We analyzed 17 Cataglyphis ant waxes that were collected from 17 different locations in Israel. 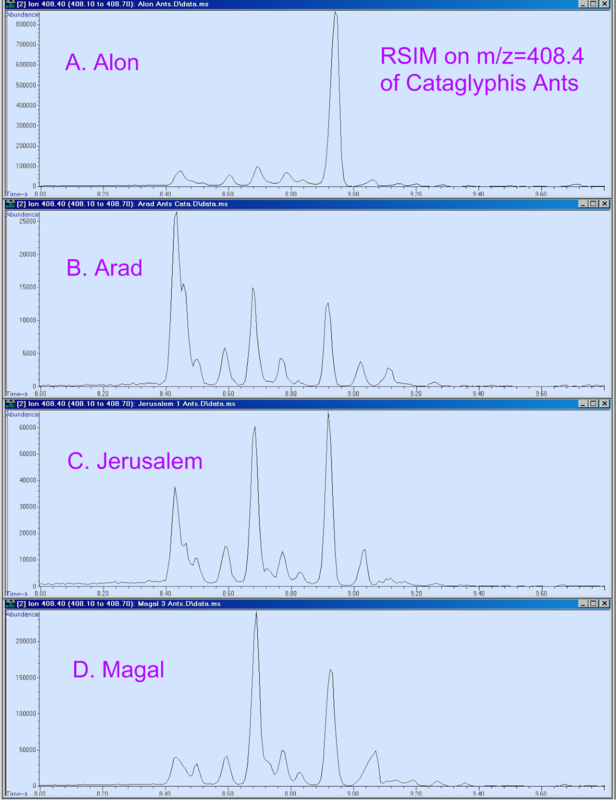 The total ion mass chromatograms showed three zones of free fatty acids, hydrocarbons and large compounds. 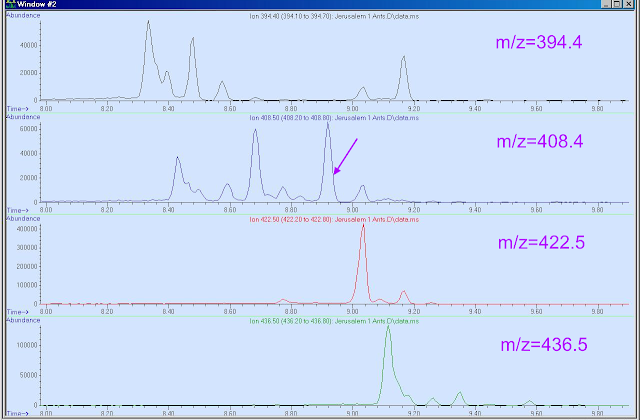 The free acids were amenable for analysis by the 5975-SMKB GC-MS with Cold EI in view of the fact that the use of fly through ion source eliminated their ion source peak tailing. While the acids contained valuable information the hydrocarbons in the Cataglyphis ants are considered as its most informative zone. The discussion of the large compounds zone of compounds in the molecular weight range of 500-800 amu is beyond the scope of this post. Our most important finding is that the ant wax hydrocarbons were mostly branched hydrocarbons and several distinct isomers were observed for each hydrocarbon. These isomers exhibited the same molecular ions with different fragmentation patterns and they eluted prior to the linear chain hydrocarbon and the greater the degree of branching the earlier were their elution times. Furthermore, we found that the isomer distributions were unique to each ant nest and the differences in the isomer distribution patterns could be substantial. Thus, we feel that such isomer distribution could play a major role in ant communication and serve as a barcode for nest mate recognition. In addition, we found that while hydrocarbons with odd carbon numbers could contain the linear chain hydrocarbons in addition to its branched isomers, hydrocarbons with even carbon number were composed predominantly from branched isomers with only little or no linear chain hydrocarbons. While the vast majority of the hydrocarbons were saturated, a few singly and doubly unsaturated hydrocarbons were also found via the help of Cold EI. In conclusion, we believe that the GC-MS with Cold EI opens the door for advanced Chemical Ecology and Entomology research and in this post we demonstrated its power in the first time demonstration of the important role of isomer distribution analysis for ant communication and recognition. Figure 1. 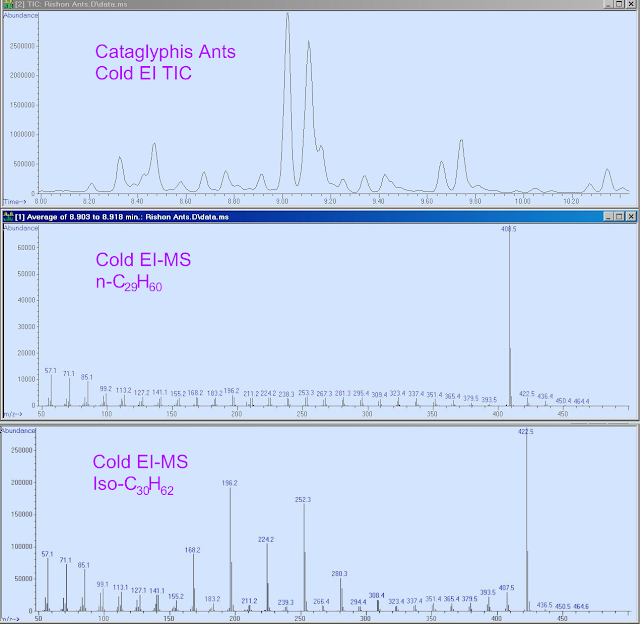 Mass chromatogram (TIC upper trace) of Cataglyphis ant wax from Rishon LeZion Israel, and representative Cold EI mass spectra of the linear chain alkane n-C29H60 (middle mass spectrum) and that of a branched isomer C30H62 (bottom mass spectrum). Note the dominant molecular ions and rich and informative mass spectral information about this wax hydrocarbon. Click on the Image to Enlarge. Figure 2. 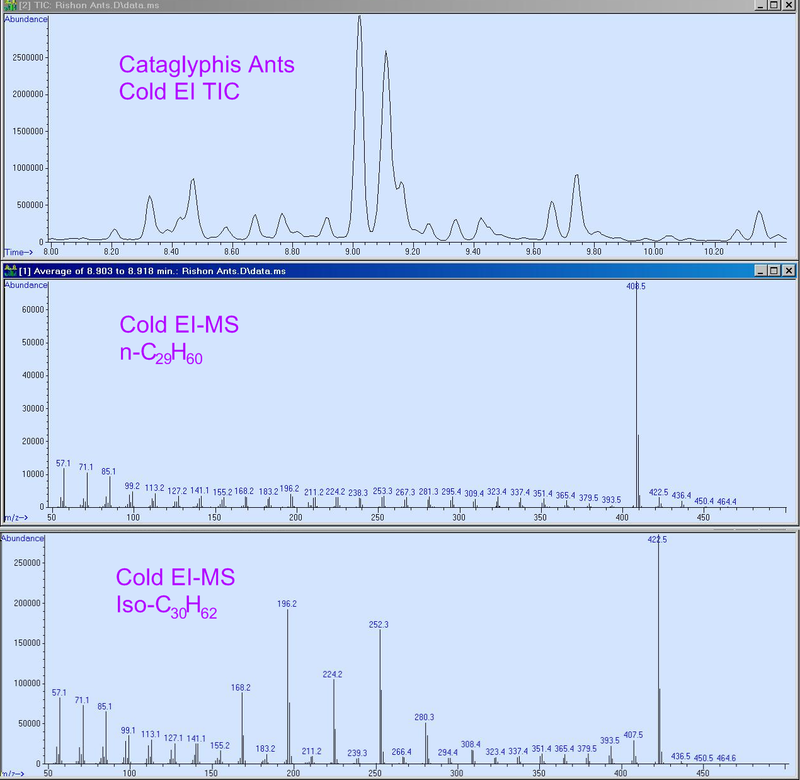 A comparison of Cold EI and Standard EI mass spectra of the indicated Cataglyphis ant hydrocarbons from Rishon LeZion Israel. Note the unambiguous identification with Cold EI in view of its available dominant molecular ion in combination with the isomer structural relevant fragment mass spectral peaks. We believe that assumed identification based solely on the branching fragments without having the molecular ion in standard EI could be misleading. Furthermore, the distinction between the mixture of 11 and 15 monomethyl and the 11,15 dimethyl is facilitated by the apparent molecular ion in Cold EI. Click on the Image to Enlarge. Figure 3. 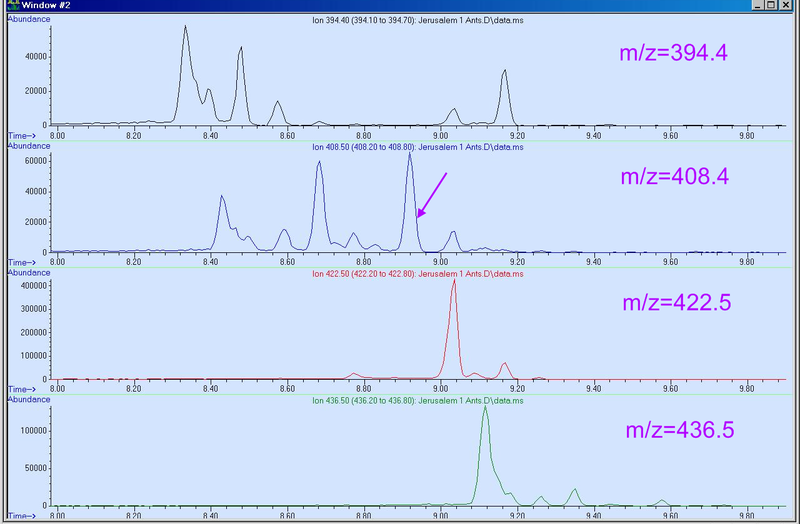 Isomer distribution analysis (IDA) of C29H60 hydrocarbons through the RSIM traces of its molecular ion at m/z=408.4. 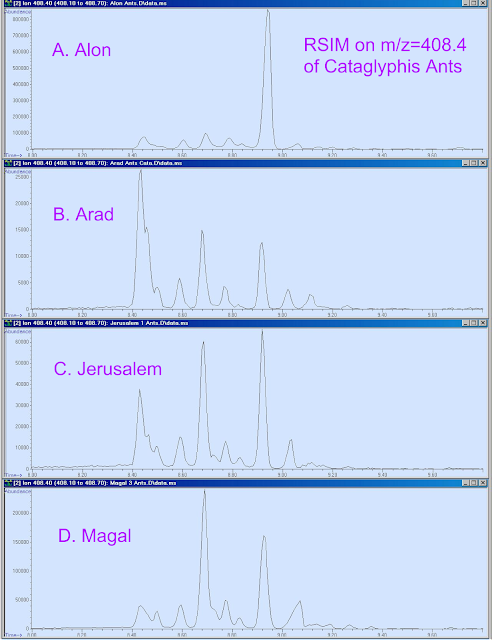 Note the observed major IDA differences between the upper trace of ants from Alon, second trace of ants from Arad, third trace of ants from Jerusalem and bottom trace of ants from Magal. All these ants are from the same Cataglyphis specie and they can not be morphologically distinguished. The linear chain n-C29H60 eluted at 8.92 min and all the peaks at earlier elution times are of its branched hydrocarbons while peak at later elution times are of the C30H62 hydrocarbon isomers that have a fragment peak at M-14 (C13 fragment of M-15). Click on the Image to Enlarge. Figure 4. 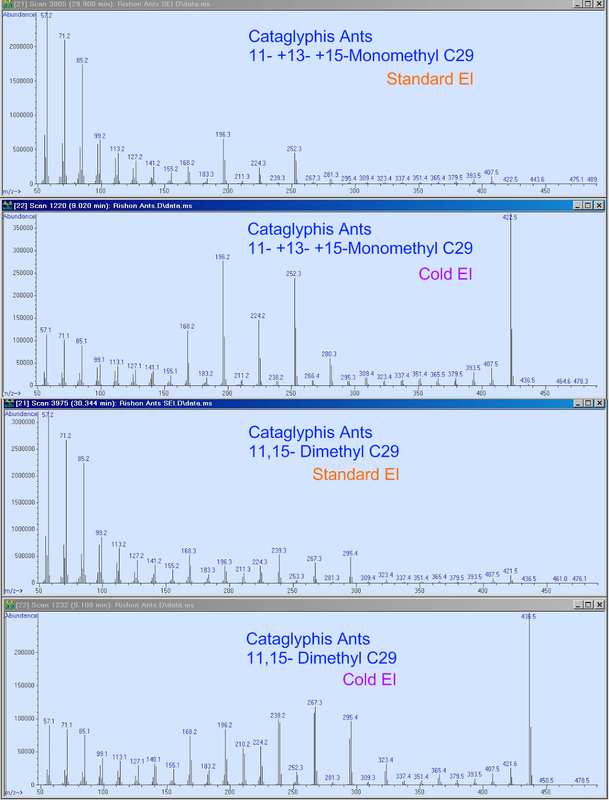 Isomer distribution analysis (IDA) of Cataglyphis ants from Jerusalem via the RSIM traces of its molecular ions m/z=394.4, 408.4, 422.5 and 436.5. Note that each hydrocarbon size has its distinct isomer distribution pattern. An important observation is that the linear chain hydrocarbons (indicated by the arrows) are relatively weak or missing for even size hydrocarbons while they are bigger and observed for odd hydrocarbons carbon numbers. Click on the Image to Enlarge.